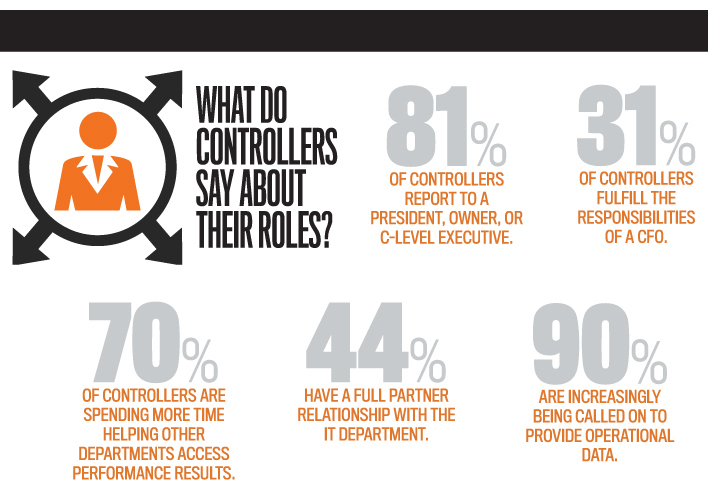 Controllers have a new role in their organizations, and strategy is the key. Traditionally their role has been process driven and governed by routines such as month-end and statutory reporting. Financial statements, general ledger, cost accounting, payroll, accounts payable, accounts receivable, budgeting, and tax compliance are typical responsibilities. Yet numerous research studies by IMA® (Institute of Management Accountants) indicate that corporate controllers are doing much more. Their role is expanding and changing in ways that mirror those of the broader finance function. Also, research conducted by IMA and its partners has shown an ongoing transformation of the finance function into more of a strategic business partner within organizations. Professionals in the finance function are moving from the delivery of data and results to the interpretation of information and contributing to decision-making activities. The role of the controller, like that of the CFO, is evolving to include higher-value-added activities and a more strategic outlook. A recent IMA study, “Evolving Role of the Controller,” indicates controllers are seeing an increased demand to apply strategic, forward-thinking skills (79% of respondents) and to provide more strategic analysis of reports (76% of respondents). In the modern workplace, controllers are contributing their expertise and talents in new ways that demonstrate their leadership and help drive their companies’ success. They’re responding to the changing expectation by placing a greater emphasis on adding value to their organizations. They increasingly participate in the analysis and formulation of solutions to more strategically oriented issues, spend time driving productivity improvements, and, in general, use their experience and skills to help the business. For example, they may use business analytics to identify customers with high profit potential. Elevate skills within the organization. As more companies embrace digital and data insights to provide competitive advantage, they increasingly see that having current technology and insightful information is critical. Thus while the traditional role of the controller involved transaction processing and financial reporting, this is now changing. IMA’s research definitely shows that the volume of information requests—for both financial and nonfinancial data—is increasing. In “Evolving Role of the Controller,” three-quarters of the controllers indicated that they are being asked more often to provide data and information to nonfinancial managers. The type of data being requested extends beyond traditional financial and budget data to include operational data (for more than 60% of controllers), key performance indicators (KPIs) (for more than half the respondents), and customer data (for almost 40%). Requests for sustainability metrics also are on the rise. It shouldn’t be a surprise to learn that demand for financial and budget data from the controller’s office is increasing, but, in many organizations, that office is also becoming the de facto link to data beyond the traditional financial information. Controllers are increasingly being asked to provide operational data and are increasingly being used to source business performance and customer data. The controller’s staff is also assisting with self-service tools, providing others with ad-hoc reporting capabilities and enabling them to drill down to customer, employee, and transactional details. But the need to provide increased information and data access creates new challenges. 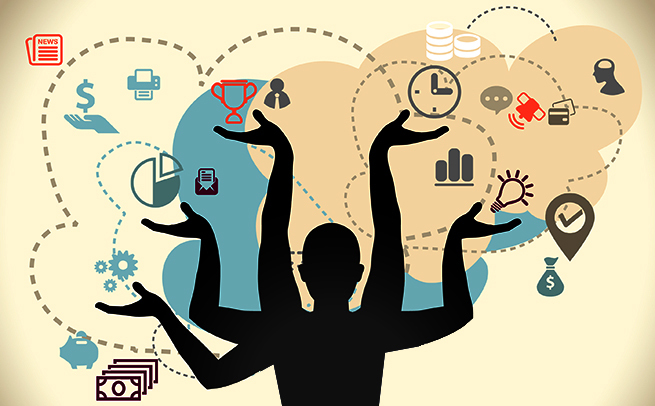 Controllers who are looking to deliver business insights need to do several things. Simplify the finance technology landscape. Many management accountants still use spreadsheet-based tools to support enterprise performance management (EPM) activities. This is particularly true for support of planning and budgeting as well as business intelligence and analysis. 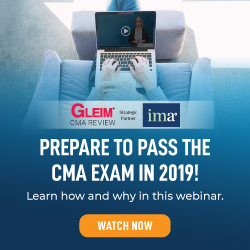 IMA’s “Enterprise Performance Management: Management Accountants’ Perceptions” found that purpose-built enterprise resource planning (ERP) modules are the most common technology (used by 44% of respondents) for supporting financial close and disclosure activities. Yet the use of spreadsheets and manual processes remains well entrenched. More than one-fourth of companies still rely on them to support financial close and disclosure activities. Even though the use of spreadsheets is widespread, satisfaction with these systems is well below that of ERP, cloud ERP, and applications developed in-house. In “Financial Insight: Challenges and Opportunities,” a recent study by IMA and ACCA (Association of Chartered Certified Accountants), having multiple ERP systems was cited as the number-one technological challenge companies face. Many finance organizations are wilting under “ERP fatigue.” Manual workarounds and reconciliations drain resources doing work that has no added value and destroys insight opportunities. Where possible, controllers need to push for system simplification. Newer technologies, such as software as a service and cloud solutions, can offer hope. Measure what matters. Research by IMA and ACCA indicates that most finance organizations are unsure where business partnering resources should be targeted to help derive the most value. They continue to report on too many metrics, and the balance between retrospective and future reporting still needs addressing. Conducting a root-cause analysis of the drivers that create value for the enterprise may be helpful. This can give a clear direction as to where business-partnering resources can be deployed most effectively to help the business create value. Improve costing systems accuracy. Numerous studies (see, for example, B. Douglas Clinton and Larry White’s Management Accounting Quarterly article, “The Role of the Management Accountant”) show that most companies are dissatisfied with their costing systems, yet they are reluctant to change those systems. For example, standard costing by far is still the most widely used costing methodology even though its shortcomings have been known for several decades. To become business partners, controllers must be able to deliver effective business insights, and that isn’t possible using an ill-suited costing system. Controllers should ensure their systems meet the guidelines contained in IMA’s Conceptual Framework for Managerial Costing and employ more accurate costing methodologies such as activity-based costing (ABC) or time-driven ABC where appropriate. Identify data requirements. Controllers need to rearticulate their information requirements to produce the most relevant data. This means increasingly drawing on both external and internal data sources, working with financial and broader business information, and analyzing both structured and unstructured data. It’s critical for controllers to understand the significant role that technology can play in both better financial reporting and growing the business. Part of the challenge is the quantity and quality of data in the finance and business systems. With multiple systems, there’s typically no “single version of the truth.” In an environment of significant change and transformation, coding practices and data taxonomies are struggling to keep pace. Data hierarchies, the way in which data is captured in the system, and the way in which reports are pre-specified don’t reflect evolving business needs. IMA and ACCA’s study, “Financial Insight: Challenges and Opportunities,” identified poor data descriptions and classification systems that don’t fit business reporting needs as an important technology and data challenge. Deploy business intelligence tools. Information technology is becoming more and more important for businesses. The amount of information available to companies has expanded exponentially in the past few years. Given the analytical and technical tools available, controllers and other finance professionals can become key resources by mastering business intelligence tools and learning how to interpret the data. Controllers are in an ideal position to wade through the data and discern which information is relevant to the business and which isn’t. This qualifies controllers and other finance professionals to become more involved in the strategic decision-making process and in making key business recommendations. It also means recruiting or developing people with good analytical skills, including data mining and extraction, statistical modeling, and operational analysis. “Evolving Role of the Controller” shows that while nearly 80% of controllers believe that the finance function adds a great deal of value to the organization, only 22% believe that those outside finance see their role as adding a great deal of organizational value. 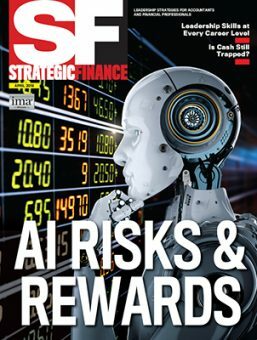 Potential causes for this discrepancy include a lack of understanding by others as to the contribution of the finance function, the need for finance to better communicate its contributions to others, and a corporate culture that doesn’t enable finance to contribute sufficiently to the organization. Implement effective business processes. There’s more pressure than ever on controllers to go beyond the “basics” of their jobs and focus on improving processes. They must be much more than experienced accountants. No matter what industry a controller is in or the size of the organization, the fundamental requirements and expectations are the same: to lead the finance department in delivering an accurate, complete set of financial statements and other data and reports while contributing to the increased financial performance of the organization. This means having the leadership skills, drive, willingness, and ability to make changes to major processes. Controllers can become good process improvers by listening to employees and managers, learning what the real issues and obstacles are, and then making appropriate changes. They must also invest time and effort in learning and understanding what the organization’s existing technology capabilities are since many of the changes needed will depend on making maximum use of and/or upgrading this technology. One of the controller’s highest priorities should be to ensure that all accounting processes are thoroughly defined, understood, and documented. In a well-implemented, computerized accounting system or ERP solution, a well-designed chart of accounts and accurate and complete integration of all subsidiary systems and automated/IT controls will substantially increase the accuracy and completeness of the bulk of accounting transactions. The rest of the processes—some of which are manual—will be easier to monitor once they have been documented and everyone fully understands them. Meet regularly with senior and operational management to discuss their needs and goals. To become a full player with a seat at the C-suite table, controllers must make certain they fully understand the organization’s mission and the goals of the corporate leaders. Based on their research into these areas, controllers should build and share their own mission statement that’s in tune with the one of the corporate leaders. This will lend clarity and will ensure that each group doesn’t inadvertently impede the other’s actions. It will also offer an opportunity for all leaders to use their unique abilities to support one another and create synergies. Make a long-term commitment. Long-term commitment is necessary to avoid the pitfall of focusing too much on short-term results. Sometimes one year’s profitability may need to be sacrificed to achieve a five-year strategic business plan. In tight alignment with other executives, controllers need to be fully focused on—and aligned to deliver on—long-term goals. The challenge is to influence upper management to think long term even if they have incentives to focus on short-term profitability goals. This may involve helping build a business case for such initiatives. Know their “proof points.” As noted previously, finance’s self-perception regarding the value it adds to the organization may not be shared by its customers or other parts of the business. So it becomes essential for controllers to “market” their brand. They need to show tangible proof that the investment in business partnering is worthwhile; they must point to clear evidence of where partnering activities are generating value. They can do this, for example, by understanding which activities have the greatest impact on organizational value and demonstrating the targeting of financial resources in a way that adds value. Being able to consistently demonstrate the value controllers and their organization are bringing to the enterprise secures sustainable commitment and helps them be seen as fully integrated into the business. Developing a balanced scorecard for the finance department that’s linked to the strategic objectives of the company can help controllers focus their efforts on value-adding activities plus show evidence of their contributions to the organization. Become a ready source of information. To become a full strategic partner in financial leadership, controllers must learn how to transform financial information and make it digestible for the rest of the business. They should look for ways to get to know the customers and other stakeholders and become familiar with the entire value chain. They must help their management colleagues in operations understand the implications of their decisions by showing them the facts behind the numbers. Proactively seek to take on additional responsibilities. Controllers shouldn’t wait until they’re asked to seek more responsibilities. For example, they could start an innovation initiative to help foster a culture of innovativeness in the organization and find ways to measure the progress. Take the initiative. Controllers should take the lead and get involved in other areas of the organization whenever possible. They should ask to be included in task forces, committees, and other initiatives to tackle various challenges. Volunteering is an excellent opportunity to get involved with different areas of the company and to showcase and develop their leadership abilities. Become a change agent. Controllers should stay on the lookout for areas that are ripe for change. And they should volunteer to help other functional areas make changes and improvements that will contribute to the organization’s strategic business goals. Welcome job diversity. Controllers need to take every opportunity to handle tasks outside the realm of finance—even if it involves something that isn’t particularly interesting to them. For example, risk management is an area of growing importance in today’s uncertain global economy. Controllers can demonstrate their leadership and get results by influencing and guiding other individuals to make wiser and more productive decisions. Here are some strategies they can implement to gain visibility within their organizations. Change the mind-set on their team. Finance leaders cite the right behaviors as fundamental to finance business partnering success but lament that they are often missing in the finance team. The capacity to build strong collaborative relationships across the enterprise, the confidence to challenge the business with authority (this comes partly from having confidence in the numbers in the first place), and the desire to have a real impact on corporate performance are all valued behaviors. In a fast-paced, competitive, entrepreneurial environment, being prepared to take calculated risks collaboratively with business colleagues and a capacity to be comfortable with uncertainty are increasingly valuable traits that controllers and other finance team members must cultivate. 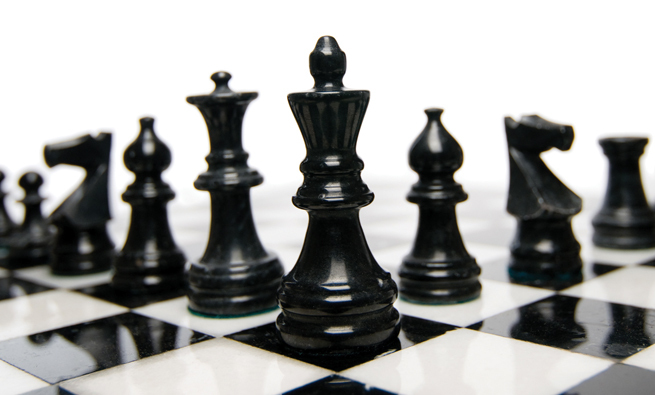 Develop strategic planning skills. Both the organization and the controller can benefit when controllers are significant contributors to strategic planning efforts. 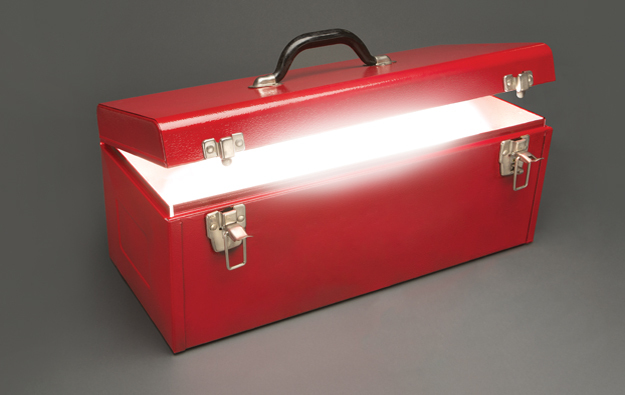 They can expand their role, visibility, and value to their organization in several ways. Becoming educated in strategic planning. Controllers should learn about strategic planning methodologies that have been applied successfully at other companies. Then they need to take the information that makes the most sense for their team and their company and put it to use. Next, they should educate staff to understand these methods and to think strategically. Extrapolating into the future. One of the best things for controllers to do is to ask themselves and other leaders at the company: “What will this situation look like a few months from now, next year, three years from now?” Doing this will help them begin to look at issues in a very forward-thinking way, which will help them formulate strategies as part of a multidisciplinary strategizing team. Using analysis and goal-setting tools. A SWOT (strengths, weaknesses, opportunities, risks) risk/opportunity analysis can be useful, as well as the SMART (specific, measurable, achievable, relevant, time-bound) method of setting goals. Develop business partnering skills. IMA research reveals that there’s a great deal of interaction between the controller and all major areas of the organization. “Evolving Role of the Controller,” for example, found that controllers are likely to have full partner relationships with information technology (44%) and internal audit (43%). They will most likely also have some level of information sharing with compliance, HR, sales, and operations. This means they need to develop business partnering skills. Plan for the capabilities that matter. Some nontechnical skills are universally essential for improving business partnering practices. These include skills in communication, process improvement, relationship building, business acumen, and the ability to cultivate a deeper business and industry understanding. Also important are the skills needed to meet the challenge of moving from austerity to growth phases and “gearing up” with the requisite business capabilities, such as flexibility and change management skills. IMA offers a variety of ways for controllers and their staff to gain these skills. Embrace continuous learning. Controllers should obtain a certification, study for an advanced degree, or take courses in such areas as leadership, engineering, and new information technologies. They also should take advantage of continuing education online webinars. All these things can help prepare them to take on increased responsibilities that involve other areas of the company. Invest in themselves. If controllers are looking to grow their career and expand their leadership footprint, they must be prepared to put some work into it, have an open mind, and be willing to step outside their comfort zone. Once again, the controller’s role is evolving. More and more controllers are asked to apply their analytical and business skills to more strategically oriented organizational issues, thus increasing the value they provide to their organizations. They are becoming business partners with operational managers to provide and use both financial and nonfinancial data to make better business decisions. 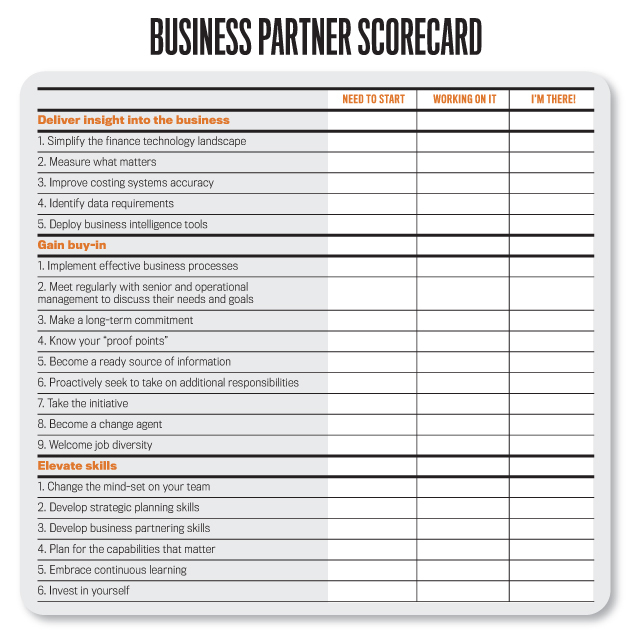 While these added responsibilities point to the potential for an exciting future for current and upcoming controllers, they also present challenges for them to be ready for this expanded role (see “Business Partner Scorecard”). By applying the recommendations presented here, controllers can move confidently into their new role and succeed in this new environment. For more information and research about how the role of the corporate controller is changing to become more strategic, check out these other publications from IMA and its partners. Douglas Clinton and Larry R. White, “The Role of the Management Accountant: 2003-2012,” Management Accounting Quarterly, Fall 2012, pp. 40-74, http://bit.ly/1UAzXN9. The Conceptual Framework for Managerial Costing, IMA Statement on Management Accounting, September 2014, www.imanet.org/MCCF. “Enterprise Performance Management: Management Accountants’ Perceptions,” IMA, July 2014, http://bit.ly/1Yx7cm2. 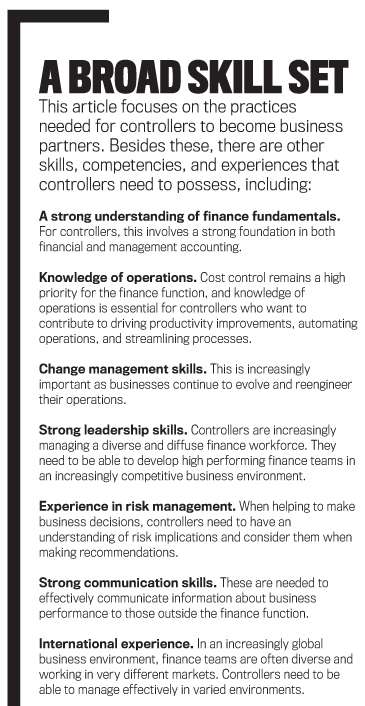 “Evolving Role of the Controller,” IMA, 2013, http://bit.ly/1OuEe46. 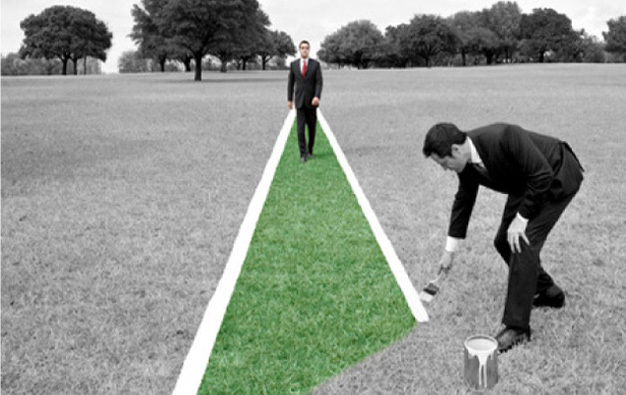 “Finance Leaders Survey Report: December 2012,” ACCA and IMA, 2012, http://bit.ly/1YxaohG. “Finance Leaders Survey Report: June 2013,” ACCA and IMA, 2013, http://bit.ly/1UEdb2T. 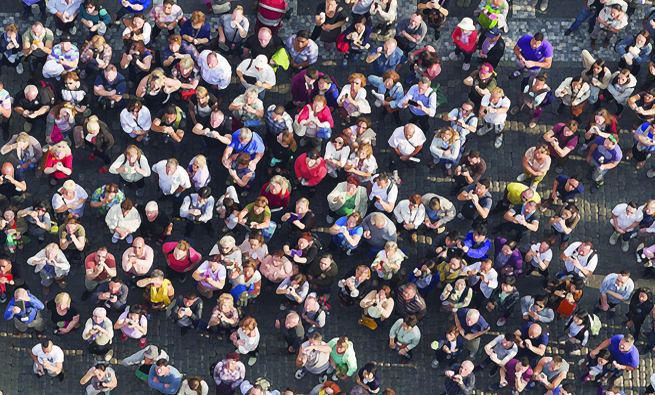 “Financial Insight: Challenges and Opportunities,” ACCA and IMA, September 2014, http://bit.ly/1sJU158. The Master Guide to Controllers’ Best Practices, 2nd edition, IMA, Montvale, N.J., 2016, http://bit.ly/1YxBF38. “Rising to the Challenge: Achieving Real-time Visibility across the Organization,” IMA, February 2013, http://bit.ly/VFuGYe. “Rising to the Challenge: Productivity in Accounting and Finance Organizations,” IMA, March 2012, http://bit.ly/2610UAL. I have hosted the regular Finance Business Partnering academies for CIMA in the UK and despite the traits and skills sets being described as “old hat” they are sadly lacking in many of the finance teams I work with. In the UK very little (if any) formal training in partnering skills are part of their professional exams and I find many senior finance staff lack the humility to admit that they need development. In some larger firms psychometric assessment of such traits is starting to happen which will hopefully improve the gene pool going forward. The article is excellent. I am teaching a graduate controllership course at regis university and added it to the reading list. While an interesting article , the topic is “old hat” and it could have come from an issue of this magazine from the 1970’s or 1980’s. Time for a new topic.